More on the Grenfell Tower aftermath, from DAVID BERRIE. When we talk about communities of care and collectivised social reproduction, THIS is what we mean. 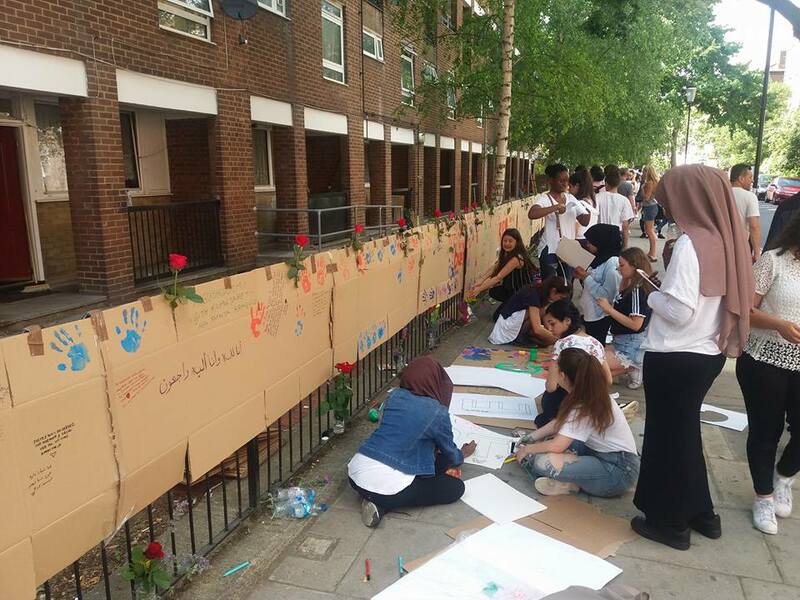 Me and a few other art therapists, some who live just a stone’s throw from Grenfell Tower, went down to the estate and just provided materials and emotional support. Two hundred teenagers then spontaneously and collectively made this memorial. The care and support they showed each other was so moving. And their anger was furious. Yesterday’s protest was the most powerful one I’ve ever been a part of. This has woken a collective rage and collective care I’ve never witnessed before. This is working class power and it is not going away. I wrote this on Friday after I visited North Kensington, and after residents stormed Kensington Town Hall. For those people not able, or who haven’t had time, to go down to the area to help or witness (witness is what I did), I hope it’s useful. Been an emotional few days like so many people in London that feel this. FRIDAY JUNE 16th. A lot of really raw anger and hurt, it’s hard to convey the emotions. When I got out of the tube, every 10-15 metres there’s random groups discussing what happened, who they knew, latest updates, and audiences gather. The streets had around 300-400 locals there. An ice cream van was giving out free ice creams (compliments from a local estate agent apparently). All along the street were hundreds of photos of people missing (i counted around 60 different people) a lot of children, whole families. You are currently browsing the People and Nature blog archives for June, 2017.